The Man In The Google Doodle: The Famously Humble Nobel Prize Winner Har Gobind Khorana : Goats and Soda He's the biochemist Har Gobind Khorana, who discovered the grammar that organizes DNA. But first he had to overcome the accent and mannerisms of his Indian village. Tuesday's Google Doodle honors Har Gobind Khorana. He would have turned 96 on this day according to legal documentation, though nobody knows the exact date the Nobel Prize-winning scientist was born. Khorana was from a small village of roughly 100 in what is now Raipur, Pakistan, but was part of India in 1922. The youngest of five, Khorana and his siblings learned to read and write from their father at a time when there were very few literate people in the area. "His family was probably the only literate family in the village. It was a struggle, I'm sure," says Uttam RajBhandary, a professor of molecular biology at MIT and Khorana's colleague and close friend of almost 50 years. "He came from a very humble background to become an icon in biology." Khorana studied chemistry at Punjab University in Lahore and did his graduate work at the University of Liverpool in England. "Actually, he was given a scholarship [by the government of India] to do agriculture because it was useful," RajBhandary says. "It turned out that the university was full of people who had come back from the war and had taken all the agricultural research spots. So the scholarship told him he might as well do chemistry then." 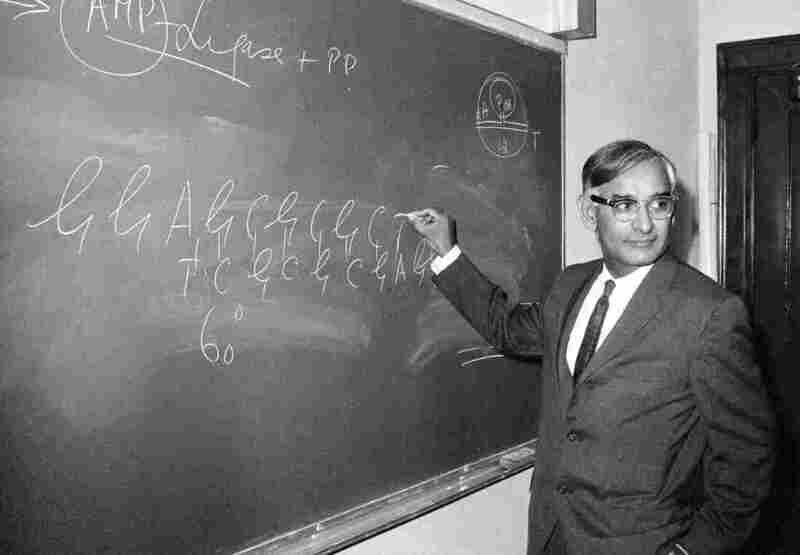 Har Gobind Khorana shared the Nobel Prize in 1968 for his discoveries about DNA. As a chemist, Khorana solved some of biology's greatest problems. In the 1960s, biologists knew there was a genetic code but didn't understand how individual DNA molecules translated into amino acids and created life. Khorana and two other scientists, Robert Holley and Marshall Nirenberg, solved that problem. In essence, they discovered the grammar that organizes the code of life. "This was thought to be the Holy Grail [of biology]. It's for this that he was awarded the Nobel Prize within two years of publishing," RajBhandary says. "He did one amazing thing after another. He was the first person to chemically synthesize a gene and show that a synthesized gene could be put into cells and function." That work made the field of genetic engineering possible. "It forms the basis of much of the biotechnology industry as we know now," he says. Despite his many accolades, Khorana was a famously humble man. RajBhandary says if he were alive today, Khorana probably would have found the Google Doodle of him funny. "He'd want to know what it was, probably. He'd be amused," he says. "For us who have known him and admired him immensely, I think [the doodle] is a good thing. Maybe he'd be pleased, I don't know." The road was often rough for Khorana as a foreign scientist from a poor, tiny village. "But whatever problem, he was determined to overcome it," RajBhandary says. "Transitioning from India to England was abrupt [for Khorana]. He knew there was this problem: You come from some village in India and your speaking mannerisms, your accent, somehow gets in the way of communicating your science," RajBhandary says. "He understood that if you can't communicate what you've done then it's useless." As a graduate student in England, Khorana would stay in on weekend nights and study BBC radio broadcasters carefully. "He listened to the way they articulated things," RajBhandary says. "Learning to speak slowly, correctly with the right emphasis. That's how he became such a tremendous speaker." Khorana later took a position at MIT. RajBhandary, who also taught many of Khorana's students, says Khorana was dedicated to teaching and sought to impress the importance of communication on his students, many of whom came from abroad like himself. "When you have a lab like his, you have people come from all over the world," he says. "He was very committed to mentoring students. He was a great person." Khorana died on November 9, 2011. He was survived by two children, Julia and Dave. "I used to see him every day. He would leave me notes here and there, just very kind notes," RajBhandary says. "When someone like that goes, you miss them a lot."